March is glum. There is no way around it, and I have been succumbing to the blahs. Yesterday I tried to envision something that would cure my blahs, but even the thought of going somewhere delicious and diving into the ocean and eating dinner outside did not feel like it would do the trick. You always have to come back from a trip like that, I kept thinking. And when you come back, it is still March. It is still gray and cold and muddy and dreary. March is glum. What March needs is a little magic. A little magic, and a little green. Hey, I thought, perhaps I could knit something a little green and a little magic. And so I did. I think it’s working. Every time I look at this little guy I feel a little less glum, and a tiny, tiny bit more like I live in a world where magic can happen. Yesterday I lived in world where only crummy stuff happens, and it keeps happening over and over. Today I spy a tiny leprechaun (is that redundant?) and it’s perking me up. In case this cure wears off I can make more and more. An army of glum busters, thanks to Anna Hrachovec and her teeny tiny mochi mochi , which has made this tiny piece of knitting magic possible. The knitting alone cheered me up immensely, and gave me a serious problem to ponder. 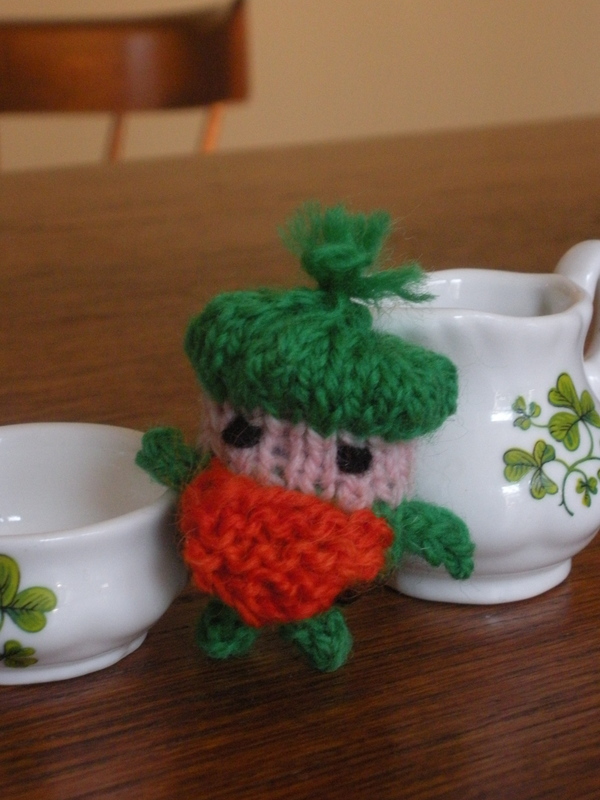 How can one knit a tiny leprechaun a hat? 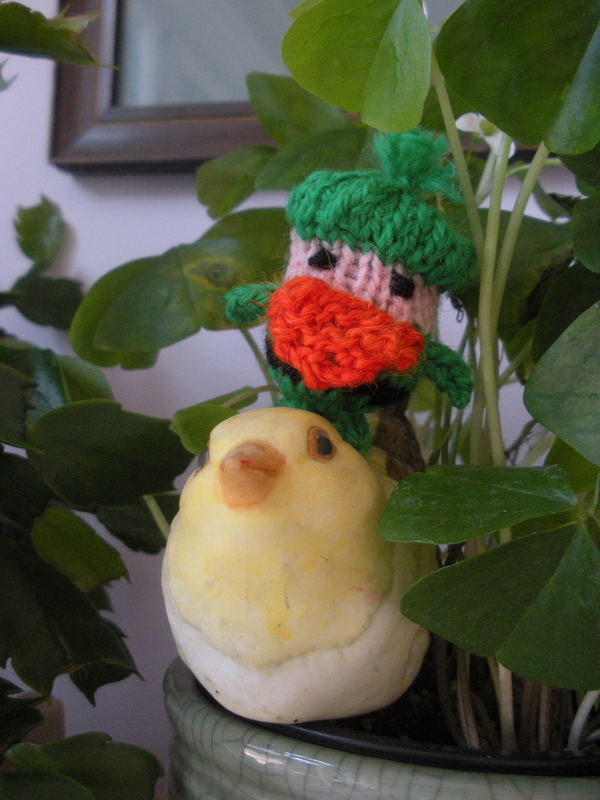 At first I attempted to knit him a top hat, which flopped right over his face. Once I hit on the idea of a tam o’shanter, (which is really more appropriate for a knit leprechaun, don’t you think?) he practically scrambled off the needles. This is just the beginning of my campaign to bring some magic into March. Next weekend I am going to make a leprechaun trap which I will share with my fellow glum New Englanders, and things will soon turn around. That’s the plan anyway. And there is nothing better than a plan. 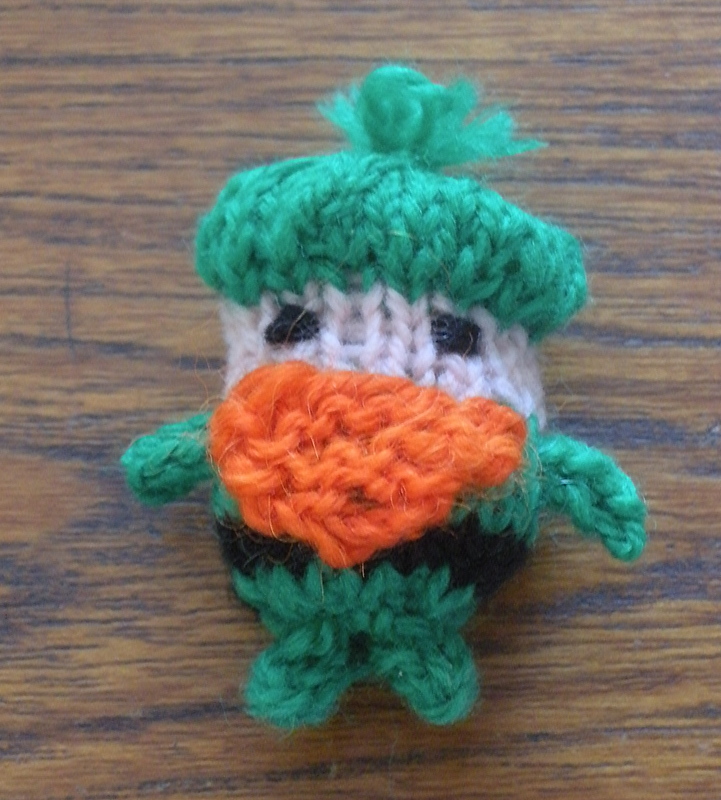 This entry was posted in Knitting, yarn and tagged Anna Hrachovec, glum month, leprechauns, magic, teeny tiny mochi mochi. Bookmark the permalink. Sally, agree with you. March is dreary in New England. Your Leprechaun is cute and cheerful. Isn’t it funny how looking at something happy makes you feel better? Very well written and so true! Nice photos too. A glass of wine and a good spot on the couch is also comforting. Thanks Martha. I love my spot on the couch. I’ll get off it when it’s warm enough to eat outside.